Welcome to Redford Fashions. Manufacturer and Supplier of Fashionable Garments. The company was established in 2010 at Chennai. We are a Trade Member of Chennai Apparel Association. Immense industry experience, Variegated payment options and Efficient logistics support help us to achieve an unrivalled position in the industry. 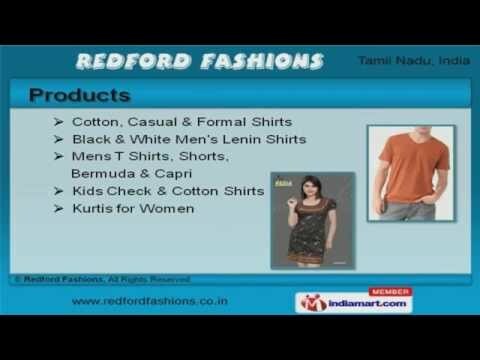 We offer a wide array of Kids Check, White Men&#039;s Lenin Shirts and Kurtis for Women. Cotton, Casual and Formal Shirts offered by us are in huge demand across the global markets. Our Black and White Men&#039;s Lenin Shirts are setting a performance standard in the market. Mens T Shirts, Shorts, Bermuda and Capri are designed specifically to produce high functionality and exhibit style. We are offering a top notch quality range of Kids Check and Cotton Shirts that are a class apart. We are a leading firm engaged in offering Kurtis for Women that are widely demanded in the market.